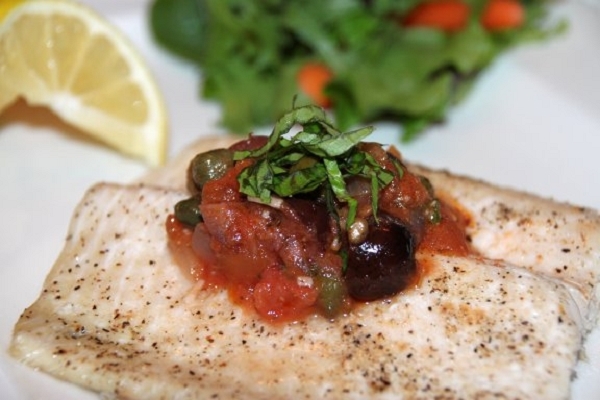 Fresh trout or flounder whitefish baked and served with a savory tomato, olive, and caper topping. Served with hearty vegetables. Simple, light and delicious fare! We've been ordering from Maria's for month's, but because I don't think the topping looks very good in the picture I have never ordered it until this week. BIG MISTAKE - This meal is really GOOD. And it is so easy to make, meets one of my top criteria, the fish goes in the oven and the sauce and green been are easy, I don't want to stand at the stove too long. We loved it! Flavorful, easy to prepare and healthy. All wrapped up in one dish! We didn't like the sauce for this fish dish. The massive amount of sauce provided and the intensity of the capers/olives sauce completely over-powered the fish. The fish itself was very good, really fresh and were generous portions, and I really enjoyed how quickly it was to prepare. I might order it again but would use only about a tablespoon of the sauce for each piece of fish. 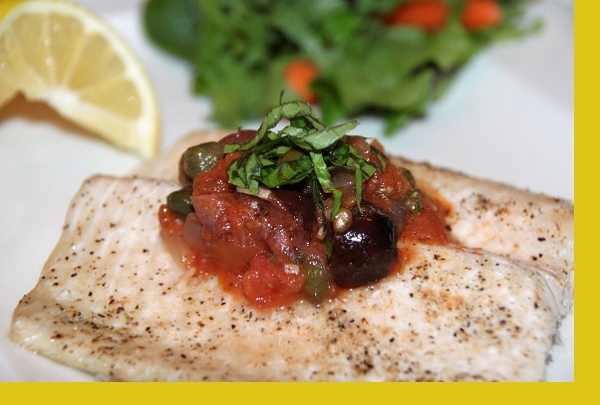 Just perfect meal for fish lovers with an unusual delicious topping. Moreover,healthy, easy and quick dinner for those who have no time to spend in the kitchen!